Day 1 of Street Line Critics on Tour in Helsinki. Photographs taken by Anastasia Artemeva and Lotte Bender. They who rushed around, showed me the importance of their goals. They who looked around, showed me the beauty of my place. The train approaches the station, but I am not ready to board. I’ve packed my suitcase like an actor acquiring props, just for show. Everyone around me, once motionless on benches, rises to the arrival of the long, red box. No longer safe amidst the cover of sitting, I feel exposed in my uncertainty. Maybe I should turn back and go home; “going home” is something my feet prefer to do. But the red box waits on the tracks, patiently, as if it were privy to all of my thoughts, all of my troubles. “All aboard,” it smiles. Towards the gates of the earthly heaven, it goes. Shows life rushing by, and you never even looked. Hello! So it is You. Yes You ! Standing there on the platform Looking back at me. You are the one, for whom I have written this poem. I am so glad you noticed me And paused for a little while to be with me. Could this have been a missed moment if you had just past me by unnoticed? I have spilled -out my thoughts to be carried across the chalk – white ocean like a message in a bottle so you could find Me. Even though the distance between us is vast. And an ocean of chalk away. Many thanks to all the support from those sponsoring the project in Helsinki, your help has been amazing and it is great to meet so many new people. Pixelache interviewed Street Line Critics on the Street Line Critics on tour in Helsinki project. For anyone who is interested please see the interview below. 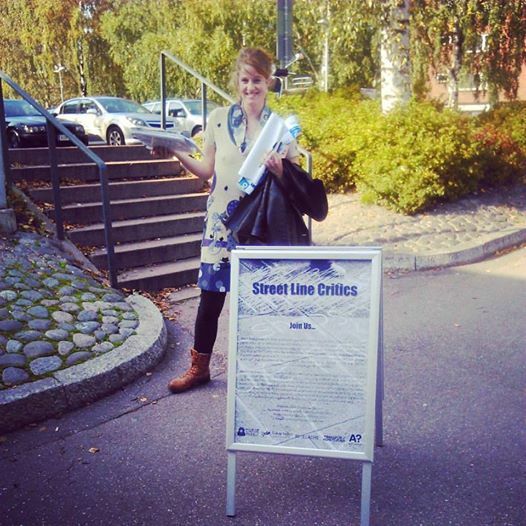 For those of you who are interested, there is still time to get involved in Street Line Critics – On Tour in Helsinki, just email us with your contribution at streetlinecritics@gmail.com or get in touch via our Facebook page. Street Line Critics is part of both the Pixelache Festival 2015 and Gaming the System event. Both Pixelache and Gaming the System (These animals collective) are amazing groups of people running very exciting events and are well worth checking out.